Some news bits I found interesting in The Connexion (November 2013 issue). * Slow computers in France are costing users 5 days a year in wasted time. Waiting for their PCs to start up (11 minutes), files to load and programs to start took on average 120 hours a year. Whoa. That's a lot of time for extra coffee breaks or water-cooler gossip! * According to Thomson Reuters, the top countries for innovative business are USA, Japan and France. That's encouraging news for Francophiles around the world! * Despite city-wide campaigns to be more tourist-friendly, Paris has still maintained its reputation of being rude according to the Anholt-Gfk City Brands Index, which measures cities by the opinion of visitors in several categories. London and Sydney were the top two and, sadly, Paris didn't even make the top 10. * Did you know that eating Frogs legs was originally a British thing? According to archaeologists from the U of Buckingham who found charred bones dating back to between 6250 BC AND 7590 BC, it seems we should switch the associations for "frog" and "rosbif!" Getting fresh, home-made Vietnamese vegetarian nems from a friend of the nannies, who sells them in the park where children play after school. Independence Day in the U.S. of A had me walking into an art gallery, the xpo gallery in fact, for Victor LeBroussois' first art show. Jumping into the digital art world, Victor's paintings were all uploaded into Google Images and then cataloged. The connection between art, the viewer, and what a computer program considers similar for cataloging all come together in all these Untitled works. An old-world, non-digital, surprise came in the form of a mime, who after surveying the other guests, found the artist and presented him with a white rose. Tres touching. Created by Cap Digital in 2009, Futur en Seine is an annual festival that presents the latest French and international digital innovations to professionals and the greater public over the course of 10 days. There are conferences, innovative projects, ateliers and more from June 13th to 16th and then throughout the whole Ile-de-France at various event partners until the 23rd of June. The first day, June 13, I decided to start my journey into the futur at the JuiceUP program. This three-hour program was for International clusters in collaboration with the European Digital Think Tank (EUDTT) and EIT ICT labs (European Institute of Innovation and Technology). After a presentation of the EIT ICT Labs and its soft landing program (presented by Ms. Isabelle DE SUTTER from Systematic Paris Region), there was a Round Table on the Internationalization of Small and Medium Enterprises (SMEs). Then, Cap Digital CEO Patrick COCQUET gave a presentation on the EUDTT, followed by another Round Table of "Networks of clusters and cluster management." The round table discussions were enhanced by an online interactive workshop using Stormz.me technology. Among the clusters present were Pole Media Grand Paris Project Manager Axel PATINET, Systematic's European Affairs Manager Isabelle DE SUTTER, CLand's General Director Marta IZQUIERDO, TSB Innovations (Berlin) EEN Project Manager Thomas VERMYNCK and University of Oulu Department of Information Processing Science (Finland) Assistant Professor Pasi KUVAJA, Pauli Kuosmanen from TIVIT in Finland, Benoit MICHEL & Pierre COLLIN from TWIST in Belgium, John McALEER from CIT Cork in Ireland and Santi FORT from Barcelona Media in Spain, although several arrived late due to the air strike. Cap Digital's European Projects Manager Nadia ECHCHIHAB led the morning's discussions. COCQUET started off his presentation with "What is Cap Digital doing for the European Think Tank." Of course Futur en Seine is a significant effort as a space for mixing different publics (the corporate public and the greater larger public) for testing innovation. They felt it was important to have a relationship with other European clusters. The activities they focus on are: exchanging market and strategy information; matchmaking between SME's and labs throughout Europe; and white papers with the goal to share global vision and work more efficiently. The common goal of these activities is to create a cluster of clusters with an European Union-wide ecosystem, with each cluster managing its ecosystem. Patrick went on to say the Creative and Cultural Industry (CCI) is a non-traditional sector. Companies (clusters) within it are creative, have the ability to innovate, are operating in a knowledge economy, have use of Information and Communications Technology (ICT) and a high impact on society. ECHCHIHAB, lead the participants on a collaborative interaction via Stormz with "What tools/actions are you using to collaborate with other foreign clusters?" Answers centered around maintaining personal contacts (Linkedin) and other meetings/conferences--in particular the EC ICT event in Vilnius which is apparently the best event to hear about future projects. (Tip: book early because there are not a lot of hotels.) VERMYNCK also mentioned Republica's ICT Conference on e-governance. He went on to generate a discussion around the differences between the Enterprise European Network and the EU Think Tank. He finds he uses the EEN a lot for helping their companies grow internationally but the women in the room didn't like using it as much, bringing an understanding to the difficulties in collaborating because of problems using, and within, the different networks. The conversation shifted to how it is difficult for startups and SMEs to travel on these trade missions abroad because they cannot afford to be away from their company for weeks, or even days, at a time. VERMYNCK offered his solution by always booking his missions for the SMEs with a day (or several afternoons) free. Then he arranges for his SMEs to work in a co-working space in Berlin so they can still work while benefiting from the advantages of going on these vital trips. Time spent away from the office lead to a discussion around funding issues in general. VERMYNCK also mentioned Erasmus for Entrepreneurs, which highlighted the point that Erasmus for business clusters like Cap Digital and the other organizations at JuiceUP does not exist yet. This brand new idea was proposed during the session and it is hoped to push this new idea to the European Commission via Marta Izquierdo who is a member of the European Creative Industries Alliance. Many in the room commented there is too much paperwork for not enough money. The challenge of having to pay for a stress test (to test the strength of the cluster) was not well received either. The cost to receive a label (ex: Gold label, Bronze label) was thought to perhaps not be worth the thousands of euros spent on it. A final comment was that Clusters (not consultants) should train clusters. Clusters learn best from others who have walked the walk, not just someone who is talking the talk. Of course, afterwards, there was much talk -- and networking. For this writer, this was a very insightful session where I learned a lot about a whole new environment and level of activity with the focus on development and innovation. 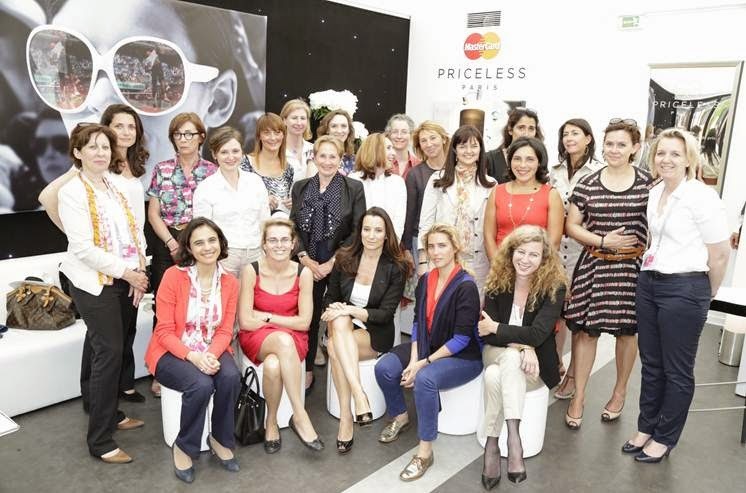 My friend Yann Emilian introduced the folks at Mastercard to me and thus, an invite to their "Priceless Women" luncheon on Wednesday, June 5th on the occasion of the French Open at Roland Garros was extended to me. This friendly and informal setting, with the upper crust tennis world as our backdrop, was a great occasion to share experiences of women having a remarkable professional course and coming from different viewpoints. After some brief networking with refreshments, Monica Biagiotti, Head of Marketing MasterCard Europe, opened up with their interest in organizing this luncheon because of a change in Mastercard. "Mastercard is in the world of change, it's not just a credit card anymore" and they want to be a network for people to connect. They want to be able to offer their clients a micro network. They created a network of women (EWLN – European Women Leadership Network) and, benefiting from their "Priceless" campaign, saw an opportunity with the French Open. The first year as a partner in the French Open, their "Priceless" cities campaign was the perfect theme -- starting right in the very "Priceless" village of shops at Roland Garros. With the re-hiring of Joyce King Thomas at McAnn agency, they thought of women who changed the world, and about things we couldn't buy before and how credit cards have changed that. That's "Priceless" for them. We had the pleasure of having former professional tour tennis player, Nathalie Dechy, with us. This three times doubles Grand Slam champion and the only female member of the Roland Garros Executive Committee shared on her professional experience. She explained how for her Sport is a metaphor for Business and how she tries to treat it in the same manner. We were then led into a round table discussion on different and similar qualities of female and male leaders and how organizations with more women at the top levels function better. Marina Catena (World Food Program), who was an Italian parachutist in the military, spoke about how being a woman in the military has changed certain protocol. In her current role she discussed the idea of using "digital money" with Mastercard to help people. There was a little discussion around the idea of the glass ceiling and women who come back to work after a certain age. The question was posed, "at what price" in response to the idea of many women who come back to work after being at home and raising children. They are not willing to put in long hours with no break like they did before. Actress Vahina Giocante (who brought her son Nino), put forth that men today also don't know the roles they should take on because changes with women in the workplace, and world, affect them too. Throughout this buffet of topics, we were able to sample an appetizing lunch of tasty morsels passed on large plates. Monica finished off the luncheon with "networking is fundamental. Do it more. Do it here." With that, we got up, and networked. Afterwards we had the pleasure to attend the matches of the day, of which I thoroughly enjoyed Maria Sharapova and Rafael Nada! At my last Cocktails with Courtney I was able to make a note of some of the tech activity in Paris. I've been keeping tabs on these places for a while now, but haven't written about them. Everyone in Paris, and most people in the States, have heard of The Tank, where I even visited once during a party when Amiando set up offices in Paris. Silicon Sentier solidifies its spot on the map with several offerings: La Cantine; Silicon Maniacs (hosting an "adieu" party to the Minitel); Le Chaudron (another co-working space in the Sentier quarter) and the Silicon Xperience. Fing is another site with links to its network and as a place for connections in the digital space. Quite frankly, my goodness! There is a lot going on here. I am not ashamed to admit I was happy in my motherhood bubble, but it's good to lift one's head up and see what else is going on in the world. It has been the coldest and rainiest Spring in Paris in forty years, according to some reports. And May 30th, 2013 in Paris was another typical rainy and chilly day. Of course it was tres chaleureux (very warm) and friendly in the Tuileries Bar at the Westin Hotel for this month's cocktails. Guenael Amieux, a long-time web producer, and I chatted for a long time about the "cyber scene" in Paris and how it's picking up; Loic Le Muer and how he seems to be considered the leading web guru around; how Google Glass is a little prejudice since glasses-wearing folks can't really test them out (unless you're wearing contacts I guess); and why is it that even to this day our phones and computers can't handle two languages at once? He cited that there's a huge population in the world that's bilingual and how, for instance, if I text my husband in Franglais (French + English), the phone will consider one of the languages to just contain a row of misspelled words. My good friend Victor Le Broussois came by, looking refreshingly springy in white jeans and crisp navy blazer. We've known each other since his early dot-com business (StockOnWeb) and our joint Cocktails with Courtney event in Cannes (2000). Victor has traded in the 1s and 0s for paints and brushes and will be showing his paintings and installation at XPO Gallery, a gallery well known for its affiliation with art at a digital age. Currently Aram Barthol is showing. His show is open only by appointment and Victor's vernissage (opening cocktail) is by invitation. (If you'd like an invite, let me know.) We'll be sure to have a report on it! The guests tonight had a chance to win a limited-edition Cocktails with Courtney t-shirt and the lucky winner was Charlotte Panis, who runs a private concierge service for people in Paris. I met Charlotte at an ISG Digital "First Monday" event and she explained in more detail how she helps travelers to Paris experience new, cozy and special restaurants, shopping and touring. Whether a seasoned traveler to Paris or coming for the first time but craving something unique, her services help the visitor see a nouveau Paris. With such a great repartee between all the guests, I'm sure the next Cocktails' will draw out more interesting folks. Here are all the pics! 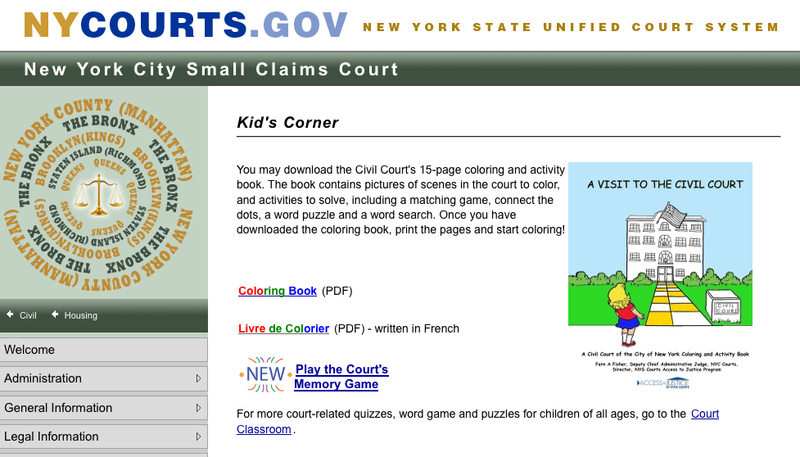 Doing some research while writing my book I went to the NYS Small Claims website. The first link that caught my eye was "Kids Corner." What the heck?! A kids corner? How many kids are going to Small Claims court?! How many people are taking their children (for whatever reason) to Small Claims court. Gee. Have times changed? Or is technology just meeting our society where it is/was? Well I may not be the best product photographer, But we have our gift bag ready for the lucky T-shirt winner for tonight's Cocktails with Courtney! Visiting my father in February I noticed how the coffee he made was delicious. Every time. And, as he's been doing for over 40 years (maybe all his adult life, not just mine), he makes his coffee the traditional way with a Melitta porcelain coffee pot and filter. Back home in France, these classic items are not to be found. No where. Except on e-bay. So, after a few more months of terrible tasting coffee from my automatic coffee maker (a Rowenta), I bought these items (below) separately. I'm even more happy that they are in this pretty pale blue color! And so, this morning I was able to finally brew my own coffee, the old-fashioned way. 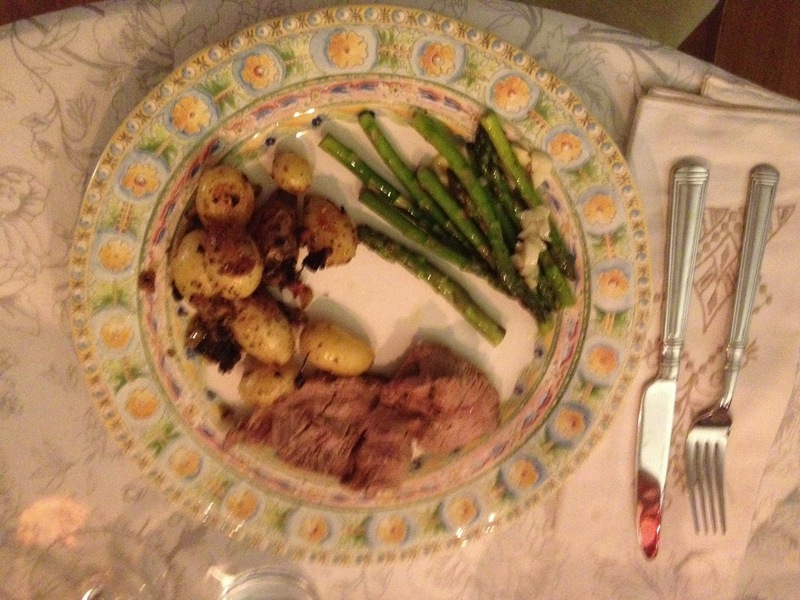 And it was absolutely delicious! So smooth and fine... Thanks Pop! "Where do you get your eyebrows done?!" They leaned back, a bit relieved, I think, that the question wasn't too personal too early on in the evening. "I do mine myself. Not too much." "I dye mine because they are so light; and I don't pluck." Huh. Encouraging but not totally helpful. The conversation delved into how French eyebrow bars pluck too much to how French coiffures just have one style they like and only cut that despite what you ask for. But then the conversation really piqued my curiosity. One of my friends doesn't even shampoo her hair! And the other one had known about this trend! It's called the "No 'Poo Movement" and it's all about not using commercial shampoo and conditioner. There are people who've joined the movement in an attempt to reduce their use of plastic. By not buying shampoo bottles they break the cycle of using plastic, adding to the recycling problem and help the environment. The other "feature" of this revolution is that by using all natural ingredients to wash your hair, you save money, don't put chemicals on your hair and actually (apparently) help your hair be more healthy but letting the scalp return to its normal natural balanced state. Apparently using (or overusing) shampoo creates an unnatural environment for your hair, producing more oils and creating that vicious cycle of having to wash frequently because your hair gets greasy. The secret is baking soda. Huh. My father has been using baking soda to clean with for decades! Could it be he was onto something, once again, before it was trendy?! As I write this, I faintly recall an article where a friend of mine was featured in the Wall Street Journal about this very topic. Back in 2004 or so. Anyway. I was riveted. I asked questions. I got answers. And I decided to try it. I went online and researched a few articles. Too distracting. Let's keep it simple. I recalled what my friend said and just mixed 1 tablespoon of baking soda with water. Except I forgot to use warm water so when I dumped it on my head I was in for a shock! Okay. I scrubbed. And I rinsed. Onto the Apple Cider Vinegar Conditioner. Also mixed with cold water. Urgh. Other than smelling like cheap wine, it seemed to be okay so far. I let my hair airdry. It was full and fluffy. Like when I go swimming in the ocean and my hair dries at the beach. The second time I played with the measurements and my hair was flat, dull and kind of stringy. Hum... Third time (yesterday), I was successful with the measurements AND warm water. Looking okay. Could it be that my hair truly is going back to its natural, healthy state? The test today was my visit to the hair salon. Would I have the guts to tell them to please not use shampoo? Would they inquire why? Would they laugh at me? Would they dump shampoo on my head anyway because what-kind-of-a-silly-request is that anyway? None of the above. They simply rinsed my hair and then we went in for the cut. My hair was more snarly than usual (oops). And each time the stylist took a section to blow dry (I figured I'd let him at least get to blow and style it) I smelled a faint whiff of vinegar. Ack! How embarrassing! Is that why Joss asked me if I had been using any products on my hair? (I said 'No...') oops. Well, I made it out of the salon without too much embarrassment. My haircut looks nice, and the no-poo experiment is going alright for the moment! This morning Simon went to a Bal Traditionnel at a stadium in Paris. The teacher said the parents could come but we had to be discreet because the children could be already very impressionne. I didn't know what to expect because my mind floated to balls with fancy dress in gold and mirrored ballrooms. This was a gymnasium and they were told to wear dark pants and sneakers. T-shirts were provided. This ecole also color-coordinated each class, providing a little colorful neckerchief for each child to wear. Simon's class had orange neckerchiefs. So we went to the stade and sat in the bleachers. The first problem was that there were not many parents so it was hard to be discreet as we stood out like sore thumbs and it was a small gymnasium. The second problem was that all the other parents were sitting down in the first row and were waving and calling to their children. So. What is this bal? Just that--a dancing ball with organized dances and "numbers." Line dancing, polkas, waltzes, boogies. Even the "put your left hand in, put your left hand out, put your left hand in and shake it all about, do the boogie, woogie and turn yourself about..." number. So after about three or four dances I started waving and smiling and of course little S finally saw me and was all excited and waving and pointing and smiling back! Then I complained how our pictures are going to be terrible because we're all the way on the other side of where S is so we can't see him as well. Dear hubby agreed to move to the other side of the stade. We moved. Now we couldn't see S and smile and wave at him when he was sitting down. We were able to see him better for the dances though. Then I got worried he was going to get in trouble because he kept jumping up and looking back at us now and waving like the little girl next to him. Shoot. And Muriel (the maîtresse) told us to be discreet! All was well until the dance was finished. Simon's class was going up into the bleachers to get their coats but Hubby wanted us to leave immediately before he saw us leave. I was afraid of leaving before he saw us because I didn't want him to feel abandoned. One minute we're all laughing and waving and the next minute he doesn't see his parents anywhere. So I stayed so I could wave goodbye to him. Uh oh. Now he started crying. Damn. My worst nightmare. Now he's crying and I don't know if I'm allowed to go down and comfort him and say "it's going to be alright little guy; don't worry, we'll see each other soon enough..." Muriel has reprimanded me before for lingering too long with S when he's crying... What do I do now? Isn't this a unique situation? Besides, all the other parents were staying and some were even putting their coats on their children! Aaaargh! So I kept walking backwards upstairs and smiling and waving and saying, "bye-bye sweetie" and "we'll see you later!" What a nightmare. I went to a glass window looking out onto the gymnasium and saw him sitting all by himself, alone, with his jacket on, CRYING! Oh God! Finally I had to just go towards dear Hubby, nagging me to just leave already! It's been cold and rainy since Winter "stopped." People have been complaining of a terrible Spring. It's definitely an indicator of Global Warming--and freezing. In either case, it's always sunny in a Cocktails with Courtney event! Our next one is May 30th so sign up and come enjoy a convivial evening with like-minded people. I've been painfully aware of the lack of posts to my dear Cyber Scene. I have at least four Cocktails with Courtney events to write-up. I think it's time for me to admit--I will get these posts written, but in the meantime, I've decided to break the barrier and put my personal life experiences here in France amidst my tech writings. I hope you'll find them as amusing as I do! ;) A tout a l'heure! As I am learning, there are lots of tech events in Paris, and there even was one in my neighborhood. So I made my way down to the International Business School's (ISG) First Monday event on Digital on April 8th, sponsored in part by the school and Kurt Salmon. We heard from several speakers on their firm's digital initiatives: Audrey Bouchet who works at BNP Paribas and Thierry Legrix de la Salle, devlopment director at Modedemploi, whose agency is one of the entities from the Happy Together group). Kurt Salmon's Pascal Ouvrard, in charge of Banking, also spoke to the audience of mostly men from a variety of non-tech backgrounds. Frederic-Gerard Leveque, Edelman SVP Digital, had a short and sweet Powerpoint presentation and, old-timer like me, we chatted afterwards about people we knew in common. One of the organizers, BPCE's Senior Banking Project Manager Olivier Chaussy, was the perfect host, introducing people and forging connections. Through him I met Maximiles Directrice Conseil Anne Fleury-Ronzier and Conciergerie Privee Charlotte Panis. Take a look at all the bad parkers in the world! Cocktails with Courtney ~ New York! My trip to New York City was a whirlwind in February. I was busy opening and pouring through over 30 boxes of my belongings, personal and professional, dating back to early childhood through 2006. As I was sorting, throwing out old papers, recycling, and organizing books to donate, I also had to decide what was "worthy" of paying shipping costs to France. A few boxes (3!) made it. I really scaled back and I can tell you when you have a finite time limit, and high shipping costs you really see what's truly valuable and what you can finally let go. Between all this, I was busy heading into Manhattan to compile paperwork for French administrative work AND trying to enjoy the time with my husband, son and father. It was a busy time indeed. However, I was able to carve out some precious hours to host a Cocktails with Courtney at Flute Midtown so I could see beloved old friends. One of my favorite Russian designers Alyona Makeeva stopped by with a friend and Mary Tierney stopped by early before heading to a concert at Carnegie Hall. Cellist Kate Dillingham also stopped by before heading out to another event. Beth Zelds, friends with Alexandra Duran, is working on onboarding businesses and ended up talking a lot with Dara Tyson. Ruben Perez, who helped me find ways to track news on the aftermath of Superstorm Sandy, told me about his new database project. Sending a tweet from the party, Howard Greenstein told me he is now, among many other projects, teaching at NYU with Tom Watson. Recursion's Henry Bar-Levav (and Cocktails with Courtney - Paris sponsor), breezed in and chatted for a long time with long-time Cocktails with Courtney attendee Wall Street Journal's James Taranto, the Sabatier Group's Joni Nelson and Michael Covitt, and Asset Development Corporation's William Noe. It was great to see one of my former employees, Janine Trusello (who's now working in events with Hip Vintage) my cousin Justin Pulitzer and good friend James Andrews of NBC Universal. Even my father and husband came by, with my son, who enjoyed his first Cocktails with Courtney drink--milk in a martini glass! Near the end I chatted with Converseon's Joan Wyly and Mark Bloch. Author and University of Washington Associate Professor Gina Neff gave me a copy of her latest book, Venture Labor: Work and the Burden of Risk in Innovative Industries, of which she graciously acknowledged the influence of my newsletter and events. Ringing in the New Year felt more trans-Atlantic this year than in years past. 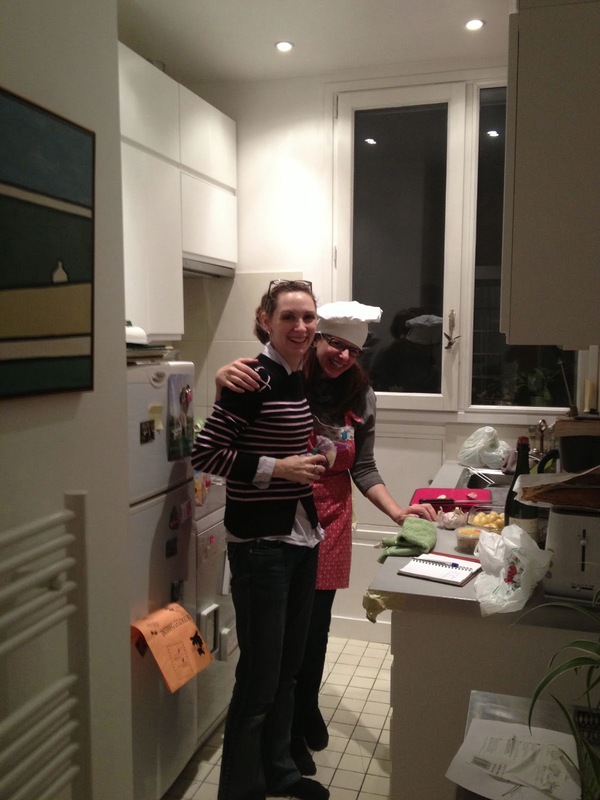 Surely I've called home when it was midnight in Paris, but this year I had one of my "state-side" friends with me! 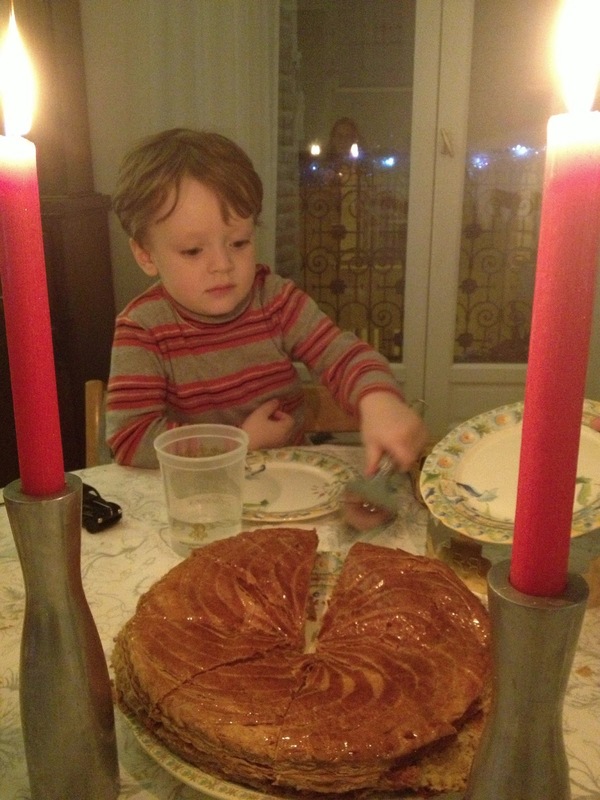 Tery Spataro came for a visit, which gave us a chance to cook some lamb shoulder (beautifully prepared by the butcher), delicious potatoes (by Tery) and a traditional galette des rois for dessert. Two days later we sat down together at the usual Tuileries bar in the Westin Hotel with other entrepreneurs for the first Cocktails with Courtney of 2013. Tery gave a talk on the confluence between people's needs and their behavior with technology and how they have evolved together to solve problems. Social Media consultant Mary B. Adams, Backend Manager at Walkin Kai Carver and lawyer and seasoned expat Philip Yook all came by for an intimate occasion to discuss the implications of Tery's talk and discuss related topics. We also got to learn about Tweego (Together We Go) as Founder and CEO Philippe Vincens explained how with his service you can search for thematic experiences (trips), join in and reserve with other participants all in a social media setting. It was a cosy and fun way to kick of 2013! Looking forward to more!